38 Long Colt ammunition has a bit of a complicated history. The round was developed by Colt as a more powerful variant of the 38 Short Colt. 38 Long Colt was adopted by the U.S. Army with Colt’s New Army M1892 revolver as a black powder cartridge. It was not an immediate the 45 Colt cartridge. The 38 Long Colt fired a 148 grain round at a 800 feet per second. The 38 Long Colt proved to be a weak loading, and the results of the Philippine-American war of 1899 - 1902 were a testament to it’s poor performance. The cartridge performed extremely poor against the Moro warriors. In fact the military units that could scrapped the revolver and re adopted the more powerful Colt Single Action Army in 45 Colt. 38 Long Colt is known to be exceptionally accurate, and found some favor with civilian shooters, and even a few police agencies adopted it. The round virtually disappeared when Smith and Wesson invented the more effective 38 Special. The round can be fired in 38 Special revolvers, but the 38 Special should never be fired in a 38 Long Colt. 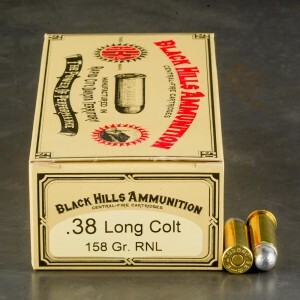 The 38 Long Colt is still being produced for military arms enthusiasts, and modern production ammo is ballistically the same as the original loads.